Bob Graham is the master picture book craftsman. He uses minimalist text complemented by pictures that speak volumes, but watch out. 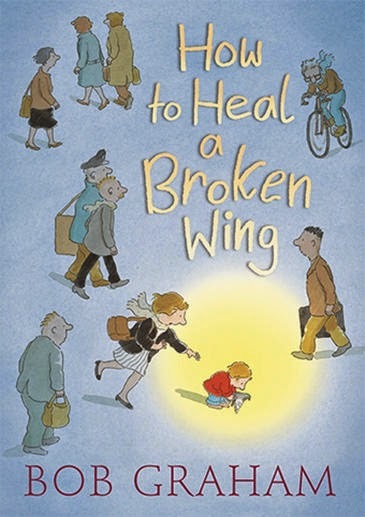 How to Heal a Broken Wing starts from the inside front cover. If you flick to where most picture books begin, you’ll miss the setup. A lone pigeon soaring high among city buildings, mistakes a seamless window for sky and knocks itself senseless when it flies into the glass. The drama of a tiny creature tumbling helpless from more than ten stories high is heart stopping. Will this little feathered creature survive? I want to know. I am totally hooked and I am only at the title page. Busy city-going shoes step over and around the helpless pigeon without a second glance. There is no sign of help until one small bay named Will stops to explore. Colour and compassion spreads across the pages as Will connects with the pigeon. And so begins a journey in which the plans of busy adults are turned upside down by a little boy’s care. Will the bird survive? Will its wing heal? Even if it does, will the bird ever have the strength to fly again? This heart-warming tale of persistent care stole my heart and echoes still with its message about what really matters in life.